Standard Concesion Supply's Popcorn Supplies comes from the finest seeds available. Our popcorn is grown in the heart of the corn belt of America so you can be assured that the quality is the finest around. Our Popcorn is selected for its explosive expansion qualities and tender flakes. Because of our dedication to bringing our customers nothing but the best, Standard Concessions Supply guarantees total satisfaction. Our popcorn machine supplies contain explosive kernels that produce the best volume yields in the industry, while delivering the best tasting popcorn available anywhere. Standard Concession Supply has available its popular Great Western or Rojo's Dual Pak Popcorn Kit pouch system which has everything to pop perfect popcorn every time. Great Pop popcorn kit is packaged with one chamber containing gourmet quality popcorn and buttery flavored salt. The other side contains high grade, low melt point, pure coconut oil. Great Pop Popcorn kit is available in either 4oz., 8oz., or 12 oz. portion packs. Great pop can also be packaged with canola oil. Stock up today on our wholesale pricing of popcorn supplies! If you don't see what you are looking for, feel free to email us at funfoods@cox.net or call us at 757-473-8951. Our warehouse inventory contains other items not listed below. Artwork subject to change without notice. Sunglo Buttery Topping by the Gallon manufactured by Great Western Products. Formerly Peters Buttery Flavored Topping Oil is now Sunglo ultimate buttery topping for popcorn lovers every where. Popcorn butter is usually considered the secret to good Movie Theater Popcorn....Sunglo Movie Time buttery topping is a delicious butter flavor topping that is used by some of the largest theatre circuits in the world. Can't get enough Butter on your Popcorn? ... Try our delicious Buttery Popcorn Topping! All you have to do is drizzle this buttery topping onto your freshly made popcorn to add the warm, buttery goodness you find at movie Theaters. Your friends and family or customers will thank you. O'Dells NT Superkist Buttery Flavored Topping Packed in Gallon Bottles. Bring the movie theater popcorn tasting experience to your home with O'Dells Non Trans Fat Buttery Topping added to your popcorn. Add flavor and enjoyment to your popcorn eating. Works great in our Butter Warmer listed below. The Paragon Butter Warmer Pump. Now you can have buttery popcorn just like the movie theaters right in your home. No need to purchase the $350.00 commercial butter warmer. Just pour in your buttery topping and in 5 minutes, you are ready to go. Also, a great product for a small business snack area or car showroom or other similar venues. Also, a great gift for the popcorn lover! Free Shipping! No Coupon Needed. Gallon of Sunglo Movie Time Canola Oil. New at Standard Concession Supply...Formerly Peters Movie Time canola oil by the gallon....Has now a new name with Sunglo Canola Oil. This oil is blended with a wonderful tasting buttery oil that will make great tasting popcorn for theater or home use. Sunglo Popping Oil is a healthy oil to pop popcorn with...without high saturated fats and cholesterol. Great flavor and great smell. The color of the popcorn will be golden yellow color. Try some today! Coconut Oil Just like they use at the movie theater. This coconut oil has been formulated for popcorn popping. This product is a Diacetyl Free Coconut oil, pure and refined. This oil will pop popcorn with a great aroma and maximum expansion of each popcorn kernel. And, popcorn popped in coconut oil simply tastes great. This coconut oil contains no trans fats. This coconut oil is sold by the gallon. Savannah Gold 5 lb. Popcorn Seed. One of the most delicious popcorn seed. The Savannah Gold has a creamy, chewy texture with mellow flavor. This sweet flavored corn tastes like you have buttered it. Our Savannah Gold Popcorn comes in an attractive new 5 lb. plastic bottle. New bottle makes it easier to handle, more convenient to store, and save you money. It's healthy and nutritious and it tastes great! White birch flavored popcorn packed in a 5 lb. plastic bottle..the perfect popcorn lovers size. The 5 lb. bottle is very easy to reclose and store after every use. Wisconsin White Birch – This delicious white popping corn pops up light and crispy, with a sweet, mild flavor. Great taste for the Holidays! Unlike other commercial brands that have been genetically altered, our gourmet popcorn kernels, featured here is 5 lb stylish plastic containers, have very tender hulls, which shatter when popped. Our smaller kernels also have a deeper, richer corn flavor. Larger kernels could be achieved by cross-breeding with field corn, but would produce a less flavorful, almost styrofoam-like texture. Our Popcorn is GMO-free - nature at its best. Our Gourmet Popcorn Seeds featured here includes Autumn Blaze, High Mountain Midnight, Sunset Fire, Orchard Blossoms, hulless Baby White Rice, and Red River Valley Gourmet Popcorn Kernels. Click on link above for further descriptions..
Peters Movie Time Home Theater Popcorn in 30 oz Plastic Jar. Grown from the finest popcorn seed, you can always count on Peters Popcorn to be the highest quality corn available. Peter’s Popcorn is the choice of the largest theatre chains mainly due to it’s explosive expansion qualities and tender flakes. When only the best will do, settle for nothing less than Peter’s 30 oz Popcorn..
Peters 30 oz Popcorn is 100% GMO Free (there has been no genetic modifications 100% natural). Peter’s 30 oz popcorn is also proudly Certified Kosher. Packaged in a air tight moisture proof reusable container for maximum freshness. Peter’s popcorn is perfect for stovetop, home poppers or campfire popping. Click on link above for instructions for stove top popping. Peter's Movie Time Popcorn Packed 12 count 30 oz Bottles per case. Great for retail stores, fundraising, or simply stock up for all your popcorn popping! For the sweet tooth and caramel popcorn lover(s) in your family, offer up some caramel popcorn glazed popcorn. For a tasty treat, simply combine this delicious Gold Medal Glaze Pop with popcorn and oil while heating. 28 ounce quart container. Great item also for a gourmet popcorn or candy shop. Also, great for tea and coffee. New at Standard Concession Supply...2.5 oz Size Portion Pack Popcorn. Packed 36 count per case. Perfect for the Nostalgia Electrics CCP-399 Popcorn Popper and cart or the Nostalgia Electrics RKP-630 Coke Popper or several other popcorn makers with 2.5 oz size kettles. Packed with the correct amount of popcorn, coconut oil, and seasoning salt. Popcorn Starter Kit for 4 oz Kettle....everything you need to get started popping popcorn with your new popcorn machine. Also great to have on hand for everyday use in your home theater room to keep your home theater popcorn machine popping. Order two to always have a backup on hand for the big parties. This Popcorn Starter Kit is for Popcorn Machines with 4 oz. Kettles. Benchmark 4 oz portion pack popcorn. Conveniently packed with oil, popcorn, and salt pre-measured for theater quality popcorn for 4 oz popcorn machines. No measuring. No mess. Just great popcorn! Call 757-473-8951 for bulk shipping rates. Dual Pak Popcorn for 4 oz. Kettle - 48 ct.
Case of Dual Pak 48 Count 4oz Individual Popcorn Packets. Each packet contains Pre-Measured Corn, Coconut Oil, and Salt. Easy to Use. Everything is pre-measured for you and ready to put in your popcorn kettle! The correct portion to pop perfect popcorn with each and every popping. No mess and no measuring! Now Pareve Certified Kosher. For more information on ingredients, click on nutritional statement. New...Popweaver popcorn now in the 4 oz kettle size. Fun Pop is the name...Delicious Buttery Weaver popcorn is the taste. Packed with 36 packs of popcorn per case. Each pack contains the pre-measured ingredients of coconut oil, buttery flavored salt, and 4 oz of popcorn to make great theater tasting popcorn with each popping. And with the aroma each popping makes, you will think that you are in a movie theater. Pop Weaver Portion Pak Fun Pop Popcorn..... Packed 5 packets per box for 4 oz Popcorn Kettles. Great for home parties and small gatherings. Pre-measured coconut oil, buttery flavored salt, and popcorn. Get that buttery taste popcorn that the Weaver Naks Pak Popcorn are known for. Designed for home or commercial use in 4 oz. poppers, or a 3qt sauce pan, or a stove top popper. Portion Pack 4 oz Popcorn. If you are looking for 4 oz. pre-measured popcorn packs without the oil and salt, then these 4 oz Peter's Movie Time 4 oz. Popcorn Packs are for you. They give you no mess and movie theater quality popcorn. These packs are a cost effective way to make popcorn for your family and friends. These are also great to sell in convenience stores and similar venues. Peter’s Movie Time Popcorn is an all natural, big yellow kernel that is popped by some of the largest movie theaters in the world. Peter’s Movie Time Popcorn is GMO Free, Certified Kosher, and is Whole Grain and Gluten Free. Packed 24 per case. New at Standard Concession Supply...Popcorn Starter Kits...everything you need to get started popping popcorn with your new popcorn machine. Also great to have on hand for everyday use in your home theater room to keep your home theater popcorn machine popping. This Popcorn Starter Kit is for Popcorn Machines with 6 oz. Kettles. Rojos Portion Pack Popcorn 36 Count for 6 oz Kettle. These Pre-measured portion pak popcorn is designed for 6 oz kettle popcorn machines or 6 quart popcorn poppers No more mess measuring popcorn ingredients for your kettle. This packet is easy to pour right into your popcorn kettle as the packet contains the exact amount of oil, popcorn, and buttery salt to pop great tasting movie theater style of popcorn for a six ounce kettle. Looking for a dual pak popcorn with an oil different than the traditional coconut oil? Then this 6oz/36 count dual pak popcorn with canola oil is for you. Canola oil has been shown to have less saturated fat than coconut oil. Now Pareve Certified Kosher. Click here for nutritional information. Popcorn Packs with Sunflower Oil for 6 or 8 oz Popcorn Kettles. Healthy popcorn oil in a complete Popcorn Making Kit. This Tri-Pak packaging includes sunflower oil, popcorn salt, and popcorn all in individual separate areas. You will enjoy high expansion popping ratio(40:1 Volume or Better) for increased profits or home enjoyment. 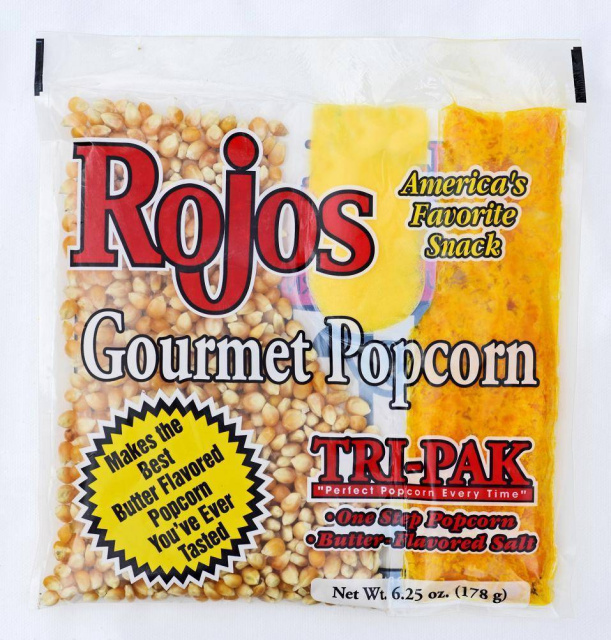 Rojos gourmet popcorn provides great taste, smell, and repeat sales. 24/8 oz Packets of Popcorn Per Case. 8 oz Popcorn Starter Kits...everything you need to get started popping popcorn with your new 8 oz. popcorn machine. Also great to have on hand for everyday use in your home theater room to keep your home theater popcorn machine popping. Order two to always have a backup on hand for the big parties. This Popcorn Starter Kit is for Popcorn Machines with 8 oz. Kettles. 8 oz. Smart Snack popcorn packs. With the new regulations for school food choices, these smart pack pre-portioned 8 oz popcorn servings are are a perfect addition to your shcool's food menu. They are gluten and peanut free with 0 transfats. Click on the link above to open the picture flyer for more info. Each package contains 8 oz of popcorn, 1.6 oz coco oil, and a tad of salt. The Great Western 8-ounce Dual Pak will work great in a six or eight-ounce kettle. This case cantains 24 packets of pre-measured eight-ounce popcorn, coconut oil, and buttery flavored salt ... very easy to use! The oil, popcorn, and salt is the same that is served in many movie theatres in the United States. Creates a wonderful aroma, and will attract customers like a magnet. Dual Pack 8 oz. Popcorn - No Salt. Now we have popcorn dual pack for those who can not or do no want any salt intake. Case pack of 24 count popcorn. Benchmark USA Portion Dual Compartment Popcorn. You have popcorn and seasoning salt on one side, and coconut popcorn oil on the other side. This convenient popcorn pack is pre-measured to make great tasting popcorn for 6 or 8 oz popcorn machines. No measuring. No mess. Just great popcorn! Pop Weaver Naks Pak with Coconut oil for 8 oz Kettle Popcorn Machinss. Packed 24 pre-measured packets per case. Includes oil, popcorn, and buttery flavored salt. Includes a great buttery flavored mix in the coconut oil. Creates a sensational popcorn aroma. 24 packs per case to be used in a popcorn machine with a 12 oz. popcorn machine kettle. Now Pareve Certified Kosher. Sunglo Popcorn Salt is a highly refined and concentrated salt. (Previously Season-it Salt) Season-it adds just the right amount of buttery flavoring to your popcorn. Add Sunglo in the kettle at the same time you pour in the popcorn and oil. Packaged here in an 35 oz or 1 quart container. Great taste and produces a great aroma. Once you try it, you will never want to make popcorn again without a buttery flavored salt. Popcorn eating will never be the same! New...delicious and high quality Kernel Seasons popcorn seasoning in a 32 oz jar. We feature here 3 different flavors that include White Cheddar, Nacho, and Ranch. Peters Movie Time Popcorn Seasonings in 5 delicious flavors. Stock up and save or if you have a store, great item for resale. Save money with these 18 pack 3 oz popcorn seasonings. Flavors include Butter, White Cheddar, Nacho Cheese, Kettle Corn, and Jalapeno. All popcorn seasonings are not created equal. Compare Peter’s Movie Time Popcorn seasonings to others brands, and you will say the Peters' is some of the best seasonings you have ever tasted. Case of 1-Ounce Popcorn Bags. 1000 count per case. Great for businesses and churches who are giving out popcorn for good will and promotions. Also great for groups who are serving or selling to children and for home birthday parties. Great size for rental stores. Need a smaller quanity of popcorn bags? Here's your solution. Bundle of 50 one-ounce popcorn bags. Great for birthday parties or business give-a-ways. 10" Popcorn Bags that hold 1.5 ounces of popcorn. 1000 count. Movie Theater Themed Pop Up Popcorn Boxes - 10 Count. Very colorful .75 oz popcorn boxes that arrive folded flat, but pop open as you squeeze them from the sides. You will feel like you're at the movies no matter where you are when you have your popcorn in these boxes. Each package ordered includes 10 individual serving popcorn boxes. Enjoy the movie! Our kid size .74 oz sccop popcorn boxes are now available by by the case. Great box to use for any children's party or event. Easy and fun to use and set-up for any party. Just scoop and fill the boxes with popcorn and then hand one out to each child at your function. Packed 500 boxes per case. Case of 500 count 1.75 oz. open top scoop popcorn boxes. Use the "scoop" style cartons with the open tops for fast fill and serve. All are shipped nested, to form a very compact shipping case for space savings. A walking billboard for popcorn to help increase impulse sales. 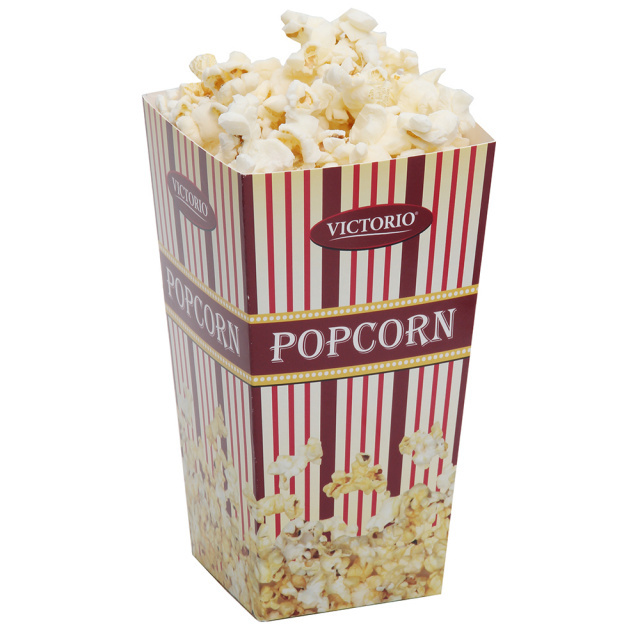 Width: 4" x Depth: 2" x Height: 6-1/2"
25 beautifully designed 3E Popcorn Boxes that can be closed at the top. Holds 1.25 Ounces of Popcorn. Case of 500 Count 1.25 oz Popcorn Boxes. Closed top box of 500 count. Great item if you need to pre-packaged your popcorn for busy events, hawking, or serving fresh at your concession stand. Exciting new Fun at the Fair Popcorn Box. Colorful and attractive 3.5 B Popcorn Box that holds 1.8 oz. of popcorn. Box folds at the top to help keep in freshness and assists in storing the pre-packaged popped popcorn. Realistic design will definitely attract more customers. Packed 500 Boxes per case. These popcorn boxes have an attractive red & white design. Remember popcorn always sells better in boxes Fold top box. Red plastic scoop not only great for filling your popcorn container, but also for sifting away the seeds from the popcorn. Plastic Popcorn Scoop Box. We now have it all at Standard Concession Supply....is it paper or plastic? If paper popcorn boxes are not your thing, and your looking to upgrade your popcorn containers, then these plastic scoop boxes are what you are looking for. They are durable and sturdy. This plastic popcorn scoop bowl is nostalgic design like years gone by. Great for movie night or social parties. Use it for popcorn or caramel corn. Holds 1 oz . of an ounce of popped popcorn. For other plastic popcorn scoop boxes and bowls, go to Popcorn Bowls. Enjoy your popcorn in these beautifully printed 85 oz popcorn tubs. Come in a box of 50. Normal price is $38.00, on SALE now for $25.70! They will not leak when buttery topping is used. Great item to be used with our buttery topping warmer listed above. New Design 85 oz Popcorn Tubs. Very attractive designed popcorn tubs that will grab the attention of customers everywhere you are.....festivals, fairs, movie theaters, and even wonderful for home theaters. Eye catching graphics featuring popping popcorn. Looking for Popcorn Machines and Carts? Visit our Popcorn Machines store.